Vern and Dorothy Garvin founded Cliff Creek Cellars in 1999. Garvin was raised in Brookings. He acquired a cable TV franchise (the third in the nation) in 1964, brought FM radio to the south coast, and installed the first commercial satellite dish west of the Mississippi. 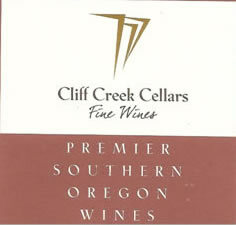 At age 69 he started Cliff Creek Cellars in Sam’s Valley, north of Medford. His vision for the winery was “big, bold reds”. Syrah and Claret is a specialty. Three generations of the family now operate Cliff Creek. Garvin passed away in 2009.